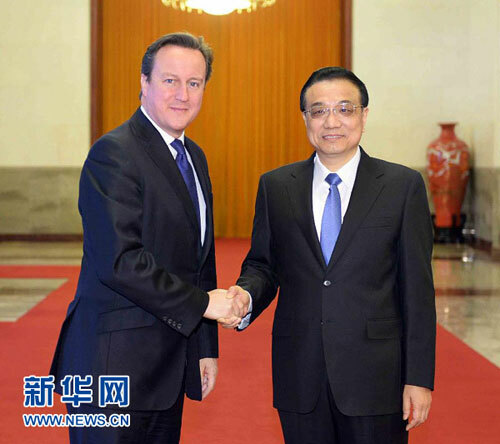 On the morning of 2 December, 2013, Premier Li Keqiang held the first annual meeting with British Prime Minister David Cameron since China's new leadership took office in the Great Hall of the People. The two sides had an in-depth exchange of views and reached important consensus on China-UK relations and international and regional issues of common interest. Li Keqiang said that China and the UK are countries of global vision and major influence. The sound and steady development of the relations between the two countries serves the common interests of both sides and contributes to world peace, prosperity and development. The two sides should insist on mutual respect, treat each other as equals, understand and accommodate each other's major concerns, properly deal with sensitive issues and invigorate China-UK comprehensive strategic partnership to bring about more fruitful achievements. Li Keqiang pointed out that the Third Plenary Session of CPC Central Committee drew up a master plan for comprehensively deepening China's reform. China will continue to push for comprehensive reform and opening-up, release market vigor and social creation and bring great opportunities to the UK and beyond. China and the UK can fully utilize their complementarities and start a new process of common growth, prosperity and progress. First is to promote trade and investment cooperation. China has safe technology and good cost performance in nuclear power and high-speech rail. The two countries enjoy broad prospects for enhanced cooperation and jointly development in third-party market. China hopes that Britain will continue to adhere to oppose protectionism, stick to a transparent and open market, maintain stability and continuity of investment policies, treat Chinese capital, technology and equipment equally and protect the interests of Chinese investors in the UK. Second is to strengthen fiscal and financial cooperation. China will follow market-driven principle and continue to support London in becoming offshore RMB market. China hopes that Britain will materialize the policy of allowing Chinese banks in wholesale business to open branches in Britain at an early date and provide more facilitation to Chinese companies that want to go listed and raise capital in Britain. Third is to deepen high-tech cooperation. We should push forward cooperation in science and innovative areas, expand high-tech trade and strengthen cooperation in aerospace, offshore wind and research in new energy. China hopes Britain will expand export of high-tech products to China. Fourth is to keep closer people-to-people exchanges. China hopes Britain will simplify visa application procedures for Chinese tourists and businesses and solve difficulties in facing Chinese employees in getting a British visa so as to give full play to people-to-people exchanges as a booster to the bilateral relations. Fifth is to maintain communication and cooperation in international and regional affairs. As permanent members of the UN Security Council, China and Britain share broad interests in maintaining world peace, advocating free trade, tackling climate change and promoting development and reducing poverty. The two sides should strengthen coordination under the UN and the G20 and other international mechanisms and work together to uphold multilateral trading system and deal with the global challenges. Li Keqiang said that as a major power in the EU, Britain plays an unique and important role in China-Europe relations. He expressed the hope that Britain will continue to exert a positive influence and make new contribution to deepening China-Europe relations and cooperation in various areas. David Cameron said that the British government places great importance on developing ties with China and is ready to enhance dialogues and exchanges and boost cooperation with China under the principles of mutual understanding and respect. The British side respects China’s sovereignty and territorial integrity, recognizes Tibet as a part of China, and does not support "Tibetan independence." The British side supports an open international trading system and is willing to further strengthen its cooperation with China in trade, investment and science. Britain welcomes Chinese companies to invest in nuclear power section in Britain and is ready to brief the China on the high-speed rail project Britain wants to build. Britain welcomes Chinese financial institutions to set up branches in Britain. It is ready to enhance communication and coordination in major international and regional affairs with China, supports the EU in expanding cooperation with China and promoting the establishment of an EU-China free trade area. After the talks, Li Keqiang and David Cameron witnessed the signing of a series of bilateral cooperation documents on investment, science and technology, finance, judicial affairs and culture. The two prime ministers also jointly met with representatives from the British business community. Prior to the talks, Li Keqiang held a welcoming ceremony for David Cameron in the North Hall of the Great Hall of the People. Vice Chairman of the CPPCC National Committee Ma Biao and others attended the ceremony.